Rain today, 80 degrees yesterday, and they are calling for 85 degrees in Craig, MT by Friday. Sounds like Spring to me! The fishing gods have been generous to us this past week. 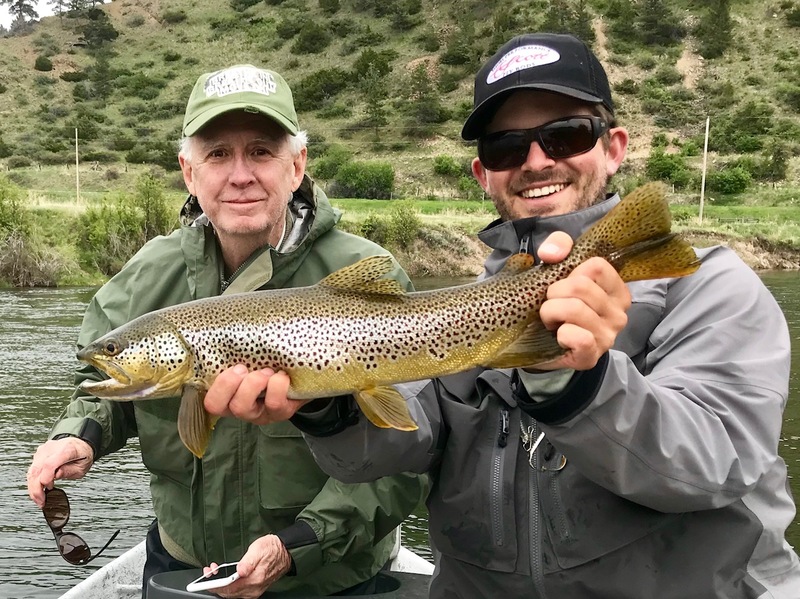 Despite variable flows, changing weather, and all of our major freestone rivers remaining blown out (check back in July), our anglers and Montana fly fishing guides were treated to consistently great fly fishing this past week. The Missouri River fished as well as it ever has for us and the Paradise Valley Spring Creeks had good hatches on the more overcast and rainy days. This will be our story for the next month. For clean water and great fly fishing, our local tailwaters and spring creeks will be your best bet. Want to learn how to fish the Missouri River at 15000+ CFS? Give us a shout to hire a guide for the day. The Missouri River is running high but clear, and has been spoiling our anglers and guides on a daily basis. We are lucky to have such an amazing Spring trout fishery in our backyard. Flows hit 15000+ CFS. And the trout couldn't be happier. More water means more food for our Missouri River trout, and great fishing for our anglers. The Missouri River is fishing great from Holter Dam all the way down to Cascade now. Lots of bugs hatching, but high water makes for limited, if any, dry fly opportunities. To consistently catch Missouri River trout above 9500 CFS, you've got to get down and dirty. Go deep in the traditional mid-river spots or shorten up and fish back towards the bank. Worms, scuds, sows, mayflies, caddis, and crayfish patterns are all getting it done. At these flows the holding water isn't obvious to the untrained eye. 2018 will be a good year to hire a pair of Missouri River trained guide eyes if yours aren't. Or wait until 2019 when flows drop again. A couple big river deep nymphing tricks: Set on everything, every time; if you aren't hitting bottom every once in a while you aren't deep enough; pile on the split shot; and don't "group shoot" i.e. the river may be big but you still have to fish the right water, at the right depth, with the right flies. Still the best wade fishing option in the state as of May 23rd. The water is clean, trout are rising, and fishing is good. You may have to pay-to-play on the creeks, but we feel it is worth every penny. Traffic has been lighter on the creeks as we shift between hatches, but BWOs and midges continue to hatch on the cooler and wetter days. Nymphing the riffles has continued to produce fish for our anglers both before and after hatches. PTs, midges, sowbugs, scuds, and caddis pupa have all produced fish. To consistently catch fish on the creeks you have to think like a fish. Where are they holding, when are they feeding, what are they eating, and how wary are they are all important questions to ask yourself. And don't forget your 6x. Flows are coming up on the Madison River. Be careful wading and floating out there. Northwestern Energy will be raising flows to a flushing flow level (~3500 CFS at Kirby Ranch) for an extended period of time over the course of the next week or so. Navigating the Sunwest and Wolf Creek bridges can become dangerous at these levels. Anchoring safely becomes a challenge. Wade fisherman should exercise extreme caution on all parts of the Madison River. Anglers wanting to fish the river over the upcoming weeks will need to go deeper, heaving, and bigger than normal to find fish. Time to break out the bobbers or big streamers and sink tip lines. Worms, stonefly nymphs, big prince nymphs, and sculpins can all get it done. Don't be afraid to put on an extra piece of split shot. Fish the softest water you can find for the most consistent results. This is a great time of year to get out on the Lower Madison River before the annual summer toob hatch. Get it while the getting is good! Still big, still muddy, still unfishable. Don't hold your breathe waiting for our freestone rivers to come back into shape. Snowpack levels are still well above average. Runoff is here and here to stay. Our magic 8 ball is telling us the Yellowstone will be good to go by July 25th +/- a week. Or it could be August 10th if the rains and cooler weather stick around. Only time will tell. I was able to get a day of rafting in on the Yellowstone River last week. Flows are very high and all floaters should exercise extreme caution. And I wouldn't take out at the Hwy 89 bridge. Big water and a tight squeeze.